The beautiful day inspired us to sit in the park to eat our lunch. We picked up some pizzas and sandwiches to go from Grandaisy Bakery. 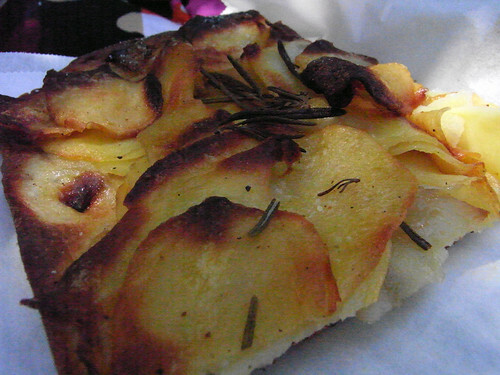 We think the pizza cavofiore is the best of the bunch (potato one pictured). The panino scandinavo (? forgot to make proper note) was equally delicious though not quite enough food for lunch, for me anyways. But I think I've mentioned wanting more sandwiches to have buttered bread, and here there was plenty of sweet cream butter on the multi-grain bread. And - Andrew in Alabama - english cucumber slices too! English cucumber slices AND butter? Cripes. This almost makes up for those sad-looking chicken fingers you posted the other day.